If you’re a man in your 20s or 30s or even in your late teens, the discovery that you are losing your hair can be a shock and a blow to your self-confidence. For many men, hair loss or thinning hair is something that happens to older people and if it happens to you when you’re younger, you may not yet fully understand what’s happening. You want to know what’s causing your hair loss, and what you should do about it. RHRLI can help. We’re experts on hair loss and the only hair restoration facility on Long Island that has the ARTAS® System, which uses robotic technology to help you find a fuller and healthier head of hair. There are several reasons why a person could lose their hair at an early age. The most common reason is androgenetic alopecia, also known as male pattern hair loss, according to livestrong.com. It’s caused by a high rate of the hormone dihydrotestosterone (DHT). But there are other reasons why hair loss can happen to people in their 20s. Trichologists have told the Times of India that early hair loss is becoming more of an emerging trend. Dr. Falvio Ferrari, an Italian scientist told the paper that stress is a major contributor to hair loss in younger men. “While genetics plays a key role in balding, a stressful lifestyle can play havoc,” Dr. Ferrari said. “Simple lifestyle changes such as, getting seven hours of sleep, having a glass of water every hour (strands are made up of minerals, which only water can replenish) and eating protein-rich foods,” can help with stress related hair loss, according to Ferrari. 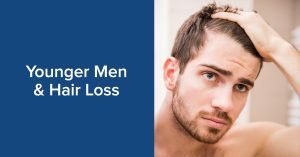 In addition to stress contributing to hair loss for younger men, losing hair can also be a stressful experience and one that can have a major effect on your emotions and self-confidence. One of the major reasons for this according to the emedexpert website, is that our culture often considers hair loss to be a sign of aging and the end of youth. Thinning hair or hair loss can also lead to negative feelings about appearance and body image and a fear of not looking attractive to others. If you’re a young man and you’re noticing that you are starting to lose your hair, the International Society of Hair Restoration Surgery recommends that you have a consultation with a doctor who is a hair restoration specialist immediately. If you are a minor, your parent or legal guardian should be at the consultation. Parental support is critical in the care of a minor and it is unethical to suggest a treatment option on a minor without educating him first. If you’re a younger patient and you’re concerned about losing your hair, RHRLI can help you explore treatment options. Our Doctor, Baiju Gohil consults with all the patients who come to the office and participates in all hair restoration procedure performed at RHRLI. To schedule your consultation, contact us today.